Koreas Resume High-Level Talks as Moon Presses for Sanction Relief - Integration Through Media ....! 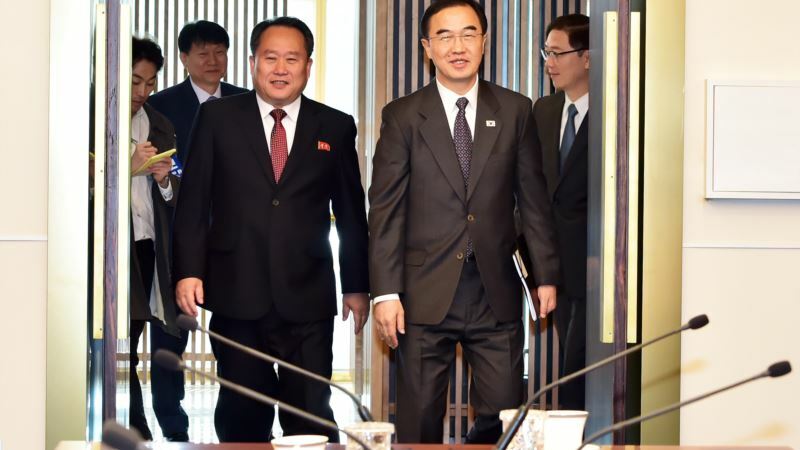 (VOA): North and South Korea held high-level talks within the heavily fortified demilitarized zone Monday. The meeting discussed the implementation agreements made during the recent Pyongyang summit as South Korean President Moon Jae-in called upon the international community to reward North Korean leader Kim Jong Un for his efforts to denuclearize. Despite Moon’s assertions, experts remain cautious that any real denuclearization progress has been made. Unification Minister Cho Myoung-gyon led the five-member South Korean delegation to Panmunjom. The South Korean team was greeted by Ri Son Gwon, chairman of the Committee for the Peaceful Reunification of the country, who headed the North’s contingent. North and South Korean leaders agreed in September during the third inter-Korean summit to intensify cross-border cooperation and to promote various programs to bring about an era of peace on the peninsula and one without nuclear weapons. At Monday's session the two nations agreed to begin a joint project to modernize and connect their rail and roadways before the end of the year. Teams will begin inspecting the transportation links mid-October on the Gyeongeui line and in early November on an eastern route. They also agreed to discuss issues related to a North Korean art troupe performing in the South as soon as possible. Furthermore, they agreed to hold Red Cross talks at the North’s Mount Kumgang Resort in November related to families separated from the Korean War. Other projects proposed by the Moon administration could be a problem, said Senior Research Fellow for Northeast Asia at the Heritage Foundation, Bruce Klinger. “All of which would be violations of [United Nations] sanctions or [United States] law,” said Klinger. However, Bruce Cumings, an American scholar who has extensively studied North Korea and the Korean Peninsula, said North Korea has made some progress. Should North Korea be rewarded? South Korean President Moon Jae-in is currently traveling on a multi-nation European tour. He renewed calls to engage with Pyongyang and ease sanctions on North Korea as it makes progress toward denuclearization. Moon said that over the course of his conversations with Kim, the “meetings have convinced me that he has taken the strategic decision to abandon his nuclear weapons.” Moon made the remarks to the Le Figaro newspaper before departing to France for a state visit. “We need to assure Kim Jong Un that he took the right decision in deciding to denuclearize and we need to accompany him in his wish for a durable and solid peace,” Moon said in the interview. However, former U.S. Ambassador to South Korea Christopher Hill said that while the atmosphere on the peninsula has changed, that wasn't necessarily facilitated by Pyongyang. The RAND Corporation's Bruce Bennett said moving forward, it’s important to know which of “three Kims” the world is dealing with: Is it the “cautious Kim,” who is concerned about internal rebellion as he moves to denuclearize, the “hard bargainer,” who is trying to get the best deal possible, or the “Kim” who doesn't want to truly denuclearize? Therefore, “we need to be testing Kim Jong Un” to determine his true intent, said Bennett. Like Ambassador Hill, Snyder said the critical question is what makes current discussions with North Korea about denuclearization different than past talks. He added it is incumbent on those “pushing forward to try and explain” what those difference are.